Justin Randolph Thompson is a new media artist and educator born in Peekskill, NY in ’79. Living between Italy and the US since 2001, Thompson is a co-founder of Black History Month Florence. 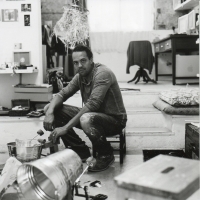 He has exhibited internationally and participated in numerous residencies in the US and in Europe in venues such as the Whitney Museum of American Art, The Reina Sofia, Blue Star Contemporary Art Museum, The Mobile Museum of Art, the American Academy in Rome and more. Thompson is the recipient of numerous awards including the Louis Comfort Tiffany Award, a Franklin Furnace Fund Grant, The FCA Emergency Grant, The EAF from Socrates Sculpture Park and a Jerome Prize from Franconia Sculpture Park and a Visual Artist Grant from the Marcelino Botin Fundation. Thompson’s work questions the implications of cultural relics and the mutability of their veneration within the context of displacement. Broadly collaborative and inherently interdisciplinary he relies upon the collective power of creative dialogue to provide platforms that envision communities as temporary monuments. Resisting a legacy of American triumph and problematizing aspirations towards Roman expansionist history, site-specific works engage community-oriented groups across disciplines in the creation of installations and sound-based performances utilizing gestures of labor as rhythmic structures. The work shifts the lens of legibility in African American history against the backdrop of a culture that uses monuments to forget.